CFF Plan is a custom font family made for Plan A Ontwerp, a graphic design studio based in Eindhoven, The Netherlands. Based on the rough sketches by the company owner we designed and mastered the complete Plan font family. Frank Vogt, Plan A Ontwerp owner and graphic designer, wanted to redesign the studio’s identity and commissioned us to craft their custom font family. He made some very rough sketches for his logo that we could digitize and make a complete font out of it. What came out of this creative challenge was the CFF Plan font family. CFF Plan A is the straight and abstract version used in the company logo. This version has no serifs and is stripped of any detail. Therefor it can be used in big sizes or as decorative element. CFF Plan B has serifs and is suitable for setting short texts. The lower case ‘e’ and ‘g’ are opened up to give the font more personality. CFF Plan C is a decorative stencil font. It’s not meant to work as a real stencil font, but should just give it more sexappeal. Most graphic designers want to create typefaces, but time and technical know-how gets in their way. This is where we come in. You might have done sketches on a font for professional- or personal use. We can digitize your sketches and craft a complete typeface from it, program the OpenType features and encodings and generate the right font format for the job. You will have a working typeface within days. Contact us if you want us to digitize your typeface. 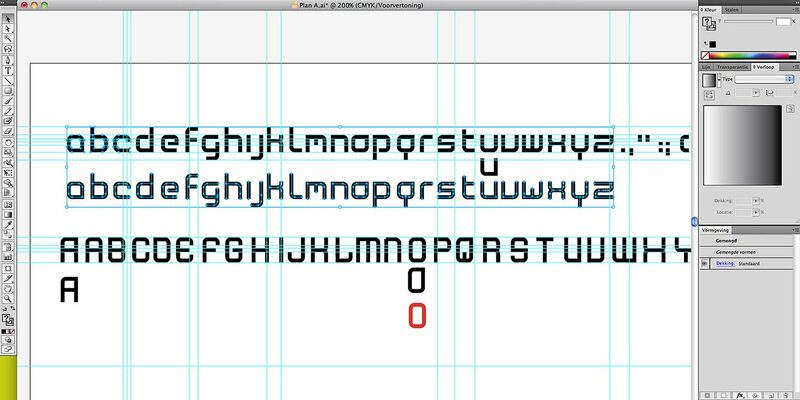 Found out more about the advantages of Font Design Digitization.